When he was seventeen, James Baldwin began writing his great, autobiographical novel about growing up in Harlem, Go Tell it on the Mountain—today it might be sold as a memoir—and would publish it after more than ten years of effort. A couple years later he wrote America’s greatest essay, for my money, which appeared in November 1955 in its first incarnation in Harper’s Magazine as “Me and My House . . .” and became the title essay of Notes of a Native Son. I quoted above from the book’s first essay because it pleases me how Baldwin struck at the sin of sentimentality with such vigor, precision, and beauty (as a boy he had reread Uncle Tom’s Cabin so obsessively his mother hid it from him; he knew its sins well). One pictures Baldwin rejoicing, or at least smiling all day, after writing that paragraph and especially its last line, a gift. Maybe he cried. The essay is beautifully structured, opening with the funeral and returning to it after scenic flashbacks and exposition. Many students love it, and it teaches well, with two caveats. The first is that Baldwin writes so gorgeously that he gets away with much exposition—his essays are classical in that sense, meditations relying on voice, and far more rhetorical than his fiction. Second, like any masterpiece it can’t be pigeonholed. Does one tell students it’s a memoir or a personal essay? (This hair-splitting will puzzle non-teachers, but students struggle with telling apart these categories, and there is a worthy if subtle distinction.) “Notes of a Native Son” is poised between its subject—perhaps America’s greatest subject, race—and personal history, the story of a man embittered by white prejudice and of his rebellious stepson who fears that he has inherited that bitterness. 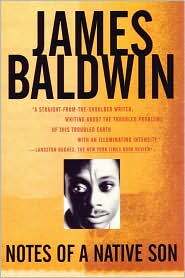 For teaching purposes I currently call it a personal essay because, though it is a great memoir, Baldwin’s intent is to show the human burden of racism. He uses his own and his stepfather’s life to explore that much larger subject, and makes white prejudice real and its effect painfully clear. In the preface to Notes of a Native Son, Baldwin writes, “I want to be an honest man and a good writer.” As far as I can see, he was both. Until his death in 1987, during self-imposed exile in France, he was also close friends with one of my favorite writers, William Styron. Baldwin’s eloquent prose is much like Styron’s, a burnished, erudite King James Bible colloquialism, but perhaps even more elegant. Fiction writer Cynthia Newberry Martin has an interesting new post about Baldwin, “Look Again,” with a link to Baldwin’s Paris Review interview, on her blog Catching Days. Richard, wonderful post on Baldwin. As I mentioned, I’ve put this essay on my list, but it’s good to have a little taste of it now. Thanks for the link too. Thanks, Cynthia. I love that point he makes, too, about the imperative of discovering your material. It’s interesting too that he goes beyond that to advocate discovering what you don’t want to know.